Fun Fact: They have sandwiches, burgers and hot dogs named after Elvis, Marilyn Monroe, Betty Boop, James Dean and Roy Rogers. Menu Highlight: Their signature steaks include a sirloin and rib eye. Fun Fact: The Flagstaff Brewing Company has one of the largest selections of single malts in the US. Menu Highlight: A popular beer is “The Great Golden Ale.” Try the bagna calda which is whole garlic cloves roasted in extra virgin olive oil and butter, served with toasted baguette. 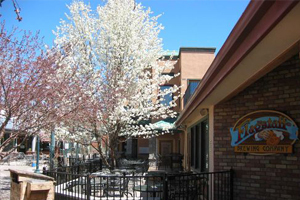 Flagstaff Brewing Company was opened in July, 1994 with the mission to provide craft-brewed beer to a thirsty mountain town, and to break the mold that has typified the atmosphere, structure and goal of brewpubs for all too long. Beer lovers, dancing deadheads, and outdoor enthusiasts congregate to share their latest adventures while enjoying the brewery’s latest creation. So sit back, pull up a pint, and take pleasure in the casual pub atmosphere of FBC. Roadkill Cafe is a fun place to stop in Arizona. Walk around the old west, take pictures in the jail. Inside there are Signs like You Kill it We Grill it adorn the walls. As you can probably tell from the name, the Roadkill Café is a dining adventure. 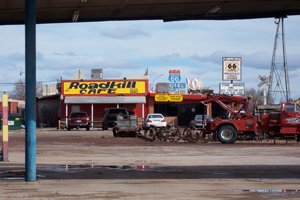 The Roadkill is famous for its charbroiled burgers. 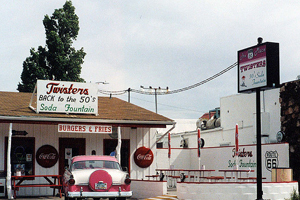 Burgers, steaks and ribs are the best to be found along Route 66. 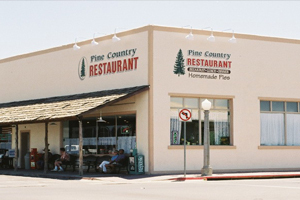 Pine Country Restaurant is the home to world-famous homemade pies. Lemon Meringue… Chocolate Covered Cherry Cream… Cookies ‘n’ Cream… Key Lime… Apple Streudel Cream Cheese… Cherry Apple Peach… Chocolate Peanut Butter… Coconut Cream… Triple Layer Chocolate Cake… Dutch Apple… plus 35 more delicious flavors including a sugar free selection made right here every day! Partner your pie with some soft serve ice cream and a cup of coffee and you’ll think you’re in Heaven! 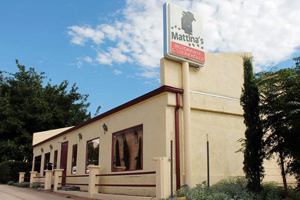 Mattina’s Ristorante Italiano is located in quaint, old Kingman, in a refurbished 113-year-old house. This popular dining spot has a history of being a traditional Italian restaurant. This restaurant is definitely worth a stop in Kingman, AZ, northwest corner of the state on US 40. There are good motels here too. The restaurant is in the historic part of the town. The cuisine is Italian and steak, an odd combination but the food is fantastic. Many years of thoughtful and knowledgeable selection of wines have given Mattina’s a wine list of distinction. A full bar with premium spirits is also available.